Improved access to diagnosis and treatment is partially achieved by establishment of so-called Malaria Service Deliverers or MSDs, in high risk areas. MSDs are people originating from risk populations and based in risk areas who are trained to provide diagnosis and treatment to their peers under supervision of, and supplied by the Malaria Program. Diagnosis is done with rapid diagnostic tests (RDTs), the results of which are cross-checked with microscopy slides. Treatment is done according to the National Treatment Protocol. The geographical distribution of MSDs in the MSD network is guided by the national surveillance system and has a focus on remote areas of high risk or areas where import of malaria is common. In addition, in areas where no MSDs are stationed yet, but which are prone to incidental outbreaks, regular Active Case Detections campaigns are executed, guided by epidemiological data. Some of these areas, depending on priority, are serviced by mobile MSDs, traveling with all-terrain-vehicles (ATV) or boat. 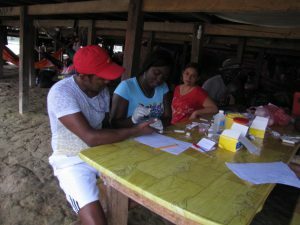 Active Case Detections (ACDs) are surveys in which the target populations are mass-screened for malaria infection and treatment is provided to persons found infected with the malaria parasites. ACD is especially employed in situations where contact between service providers and risk populations are irregular or limited, as is the case in populations who are involved in cross-border mobility. 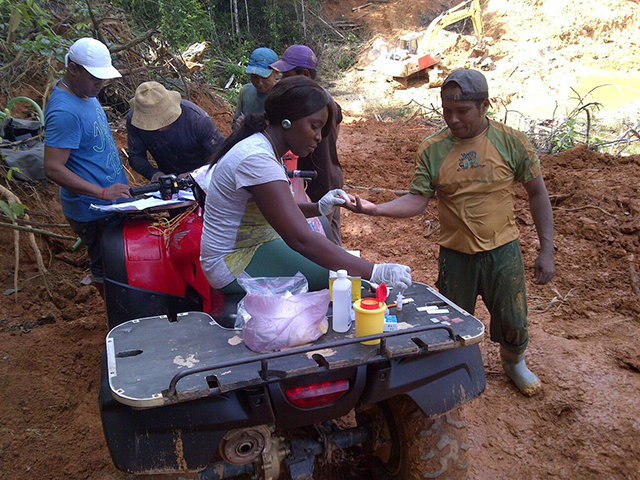 Conducting Case Investigation is a key factor in the Test, Treat and Track or T3 Initiative of the World Health Organization. Collecting information on the locality of disease transmission is essential in guiding targeted interventions. Trained MSD-supervisors of the Malaria Program support the local MSDs with case investigations in the areas of transmission.